Poland is faced with a stark choice: either it will be smaller and poorer or it will be more diverse. This is the inevitable conclusion to draw from the country’s present demographic situation. With a fertility rate of just over 1.3 – one of the lowest in the world – Poland’s population will shrink without increased immigration, bringing negative consequences for economic growth and capacity to support an ageing society. At present, there may be as many as two million Ukrainians working in Poland, filling gaps in the labour market. Many of them could soon leave for other European destinations, with Germany already preparing to liberalize its rules to attract them. Poland will need to find replacement workers from further afield, even if some Polish nationals also return home from Brexit Britain. The problem will only intensify as the effects of the demographic crisis become more severe. First President of the Supreme Court Małgorzata Gersdorf addresses protesters in July 2018. Source: Reuters/M. Gocłowski. Since winning power in October 2015, the Polish government led by the Law and Justice (PiS) party has introduced a raft of changes to all levels of the country’s judicial system. Domestic opponents, along with the European Commission and the Venice Commission, have accused them of undermining the rule of law and flouting the Constitution. Protesters have filled the streets at regular intervals. Yet the abstract nature of the changes and the unappealing involvement of the parliamentary opposition have made it difficult for the resistance movement to gain any real popular momentum. Many Poles find the new laws excessive, but most also feel that the judicial system genuinely needs reform. My aim in this article is to put the key changes and their consequences together to show the big picture. Both the expert Venice Commission and the European Commission have emphasized that the cumulative effect of the reforms significantly exacerbates their potential consequences. Most of the measures are concerning in themselves, but some are arguably defensible in isolation. Only when the changes are viewed together does the true scale of the threat to rule of law in Poland become clear. Rywka Wajnberg and Małka Wakslicht, Polish Jews in hiding in Biłgoraj during the Second World War. Image Source: Gazeta Wyborcza. In 2018, the Polish government’s politics of memory have been a public relations disaster for the country. 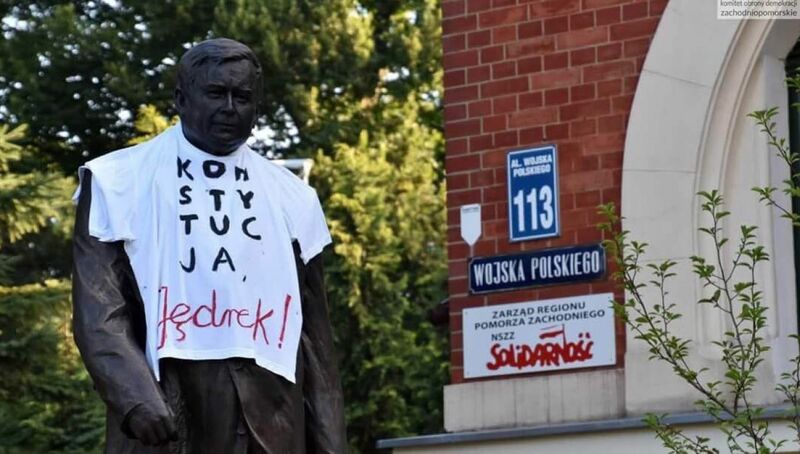 A declared intention to defend the good name of “the nation” against false accusations of collaboration in the Holocaust has instead created a wave of international outrage and negative media coverage of Poland’s past and present. From the misconceived formulation of the so-called “Holocaust law” to clumsy public statements from Prime Minister Mateusz Morawiecki, Poland’s leaders have drawn international attention to the vexed question of Polish complicity with German crimes instead of clarifying a complex and painful history in which Polish Jews and non-Jewish Poles suffered on an enormous scale. It is true that Western understandings of Poland’s history under the German occupation are often inaccurate, but the government has only exacerbated the problem through a mixture of tone-deaf incompetence and cynical manipulation of domestic emotions. In belated response to the public relations fiasco, the Polish parliament ratified a hasty “correction” to the law this week, but the damage to Poland’s reputation had already been done.